How is it that a brief gesture can last millennia? It was this fascination with the chance of perpetuating a gesture through matter, this paradoxical time play, that brought José Pedro Croft in contact with sculpture, initially collaborating with José Cutileiro on his marble pieces. Strongly drawn to essential forms and the deconstruction of objects and spaces, Croft’s work is deeply rooted in the ancestral origins of sculpture and its symbolic relationship with death (making present those who are absent) and with the (re)assignment of meaning to space (for example, cromlechs and menhirs defining otherwise undifferentiated territories). Since the 1980s, the decade of his artistic affirmation, Croft has produced an extensive body of mainly abstract work, often introducing furniture parts that generate a dialogue with simple geometric forms, as well as a tension by means of mirrors, creating new spatial configurations based on deconstruction and metaphorical games. Escada [Ladder] is deeply connected with a tree. 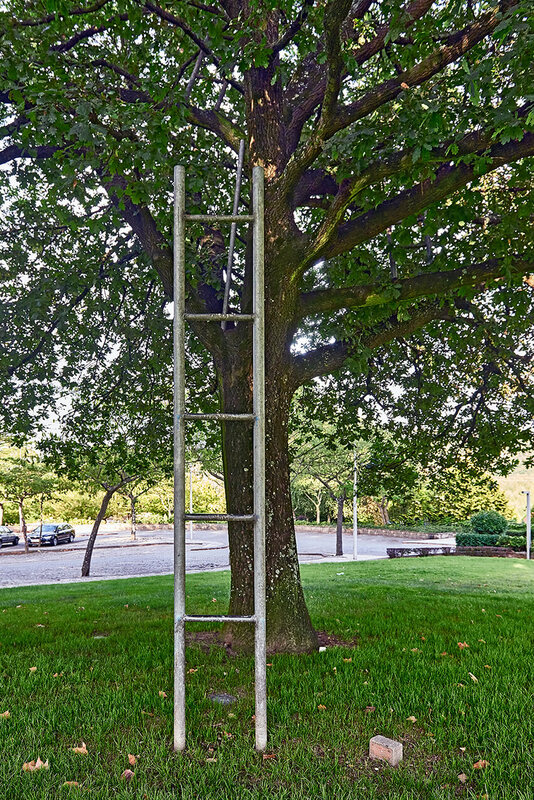 A series of ladders go up the tree branches, as if encouraging viewers to recollect their childhood fascination with tree climbing. More than objects in space, Croft recreates the tree as a place in itself through a symbiosis between natural and man-made objects, redefining the boundaries between the two and challenging viewers to revisit the symbolic universe of childhood and dreams. Metaphors cascade down the sculpture-tree built by José Pedro Croft — ladders pointing at the sky, the will to go higher, growth into adulthood, and the risk of falling rekindling our lust for adventure.